جیریایی شراهی, رضا, روشندل کاهو, امین, سیاهکوهی, حمیدرضا. (1393). تضعیف نوفه همدوس زمین غلت با استفاده از ترکیب ردلرزه شعاعی محلی و فیلتر میانگین. 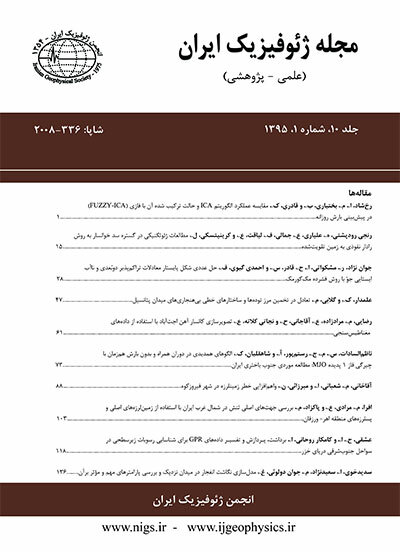 مجله ژئوفیزیک ایران, 8(1), 1-12. رضا جیریایی شراهی; امین روشندل کاهو; حمیدرضا سیاهکوهی. "تضعیف نوفه همدوس زمین غلت با استفاده از ترکیب ردلرزه شعاعی محلی و فیلتر میانگین". مجله ژئوفیزیک ایران, 8, 1, 1393, 1-12. جیریایی شراهی, رضا, روشندل کاهو, امین, سیاهکوهی, حمیدرضا. (1393). 'تضعیف نوفه همدوس زمین غلت با استفاده از ترکیب ردلرزه شعاعی محلی و فیلتر میانگین', مجله ژئوفیزیک ایران, 8(1), pp. 1-12. جیریایی شراهی, رضا, روشندل کاهو, امین, سیاهکوهی, حمیدرضا. تضعیف نوفه همدوس زمین غلت با استفاده از ترکیب ردلرزه شعاعی محلی و فیلتر میانگین. مجله ژئوفیزیک ایران, 1393; 8(1): 1-12. محلی و فیلتر میانگین ابزاری مناسب برای تضعیف نوفه زمین غلت است. Reflection seismic data is often contaminated by a variety of coherent and incoherent noises. Ground-roll is a type of surface wave. It is a form of coherent linear noise, which propagates at the surface of the earth, at low velocity and low frequency. This kind of noise will often obscure the seismic reflection data. Various methods have been introduced by many authors to attenuate the ground-roll in reflection seismic data. Most of these methods are based on a transform. Deighan and Watts (1997) tried to eliminate the ground-roll by using the wavelet transform. A number of researchers used Karhunen-Loeve transform to suppress the ground-roll noise from seismic data (Liu, 1999; Montagne and Vasconcelos, 2006). Porsani et al. (2009) presented the singular value decomposition (SVD) filtering method for attenuation of the ground-roll. In this method, the seismic data must first be NMO corrected. Naghizadeh and Sacchi (2011) eliminated the ground-roll noise by scale and direction guided curvelet transform. One of the most important and common methods to attenuate coherent linear noise such as ground-roll in a prestack gather is based on the radial trace transform. It is a simple coordinate transform of offset-time (X-T) into the radial-time (R-T) coordinate. This transform was introduced and developed in the Stanford Exploration Project by Clearbout (1975), Ottolini (1979, 1982) and Taner (1980). They used the radial trace transform for migration of seismic data and multiple attenuation. Clearbout (1983) and Henley (1999, 2000 and 2003) attenuated the coherent linear noise by the radial trace transform. We can separate the coherent linear noise from reflection seismic data when the transform coordinate paths are appropriately aligned with the coherent noise direction in the X-T domain. Applying the radial trace transform on a seismic shot gather causes coherent linear noise which is distributed across many traces in the X-T domain maps into relatively few radial traces and reduces their frequency. The most straightforward technique to reduce coherent noise in the R-T domain is to apply a high-pass (low-cut) filter to the radial traces. In practice, interpolation is an important stage in the radial transform and can leave a damaging impact on performance. Therefore, application of the transform will result in missing data. However, advanced interpolation methods can reduce the omitted data problem. In this study, we used a different method based on radial trace filtering, named local radial trace mean filtering that does not require a forward/inverse radial trace transform. Consecquently, it does not require interpolation algorithms. To investigate the efficiency of the proposed method, we test the local radial trace mean filtering on both synthetic and real seismic data. We also compare the obtained results by those from the f-k filtering for seismic data ground-roll suppression. To investigate further, we apply the method on synthetic seismic contaminated by random noise and find that the method is not sensitive to the presence of random noise. Also, in cases where the receiver intervals are not the same, unlike the f-k filtering, local radial trace mean filtering is very effective. Therefore, we can say that the local radial trace mean filtering method is a suitable tool for coherent linear noise attenuation, especially the ground-roll. باقری، م.، و ریاحی، م.، 1387، تضعیف نوفه‌های زمین‌غلت در حوزه ردلرزه شعاعی، مجله فیزیک زمین و فضا، 34(4)، 33-47. بوستانى، ب.، 1390، تضعیف نوفه‌هاى تصادفى و زمین‌غلت در داده‌هاى لرزه‌اى با استفاده از تبدیل curvelet، پایان‌نامه کارشناسى ارشد رشته‌ مهندسى نفت-اکتشاف، دانشکده مهندسى نفت، دانشگاه صنعتى امیرکبیر. سیاه‌کوهی، ح.، 1379، استفاده از تبدیل Karhunen-Loeve در پردازش داده‌‌های لرزه‌ای سه‌‌بُعدی، مجله فیزیک زمین و فضا، 26(1)، 97-106. Claerbout, J. F., 1975, Slant-stacks and radial traces: Stanford Exploration Project Report, SEP-5, 1-12. Claerbout, J. F., 1983, Ground roll and radial traces: Stanford Exploration Project Report, SEP-35, 43–53. Deighan, A. J., and Watts, D. R., 1997, Ground-roll suppression using the wavelet transform: Geophysics, 62, 1896–1903. Henley, D. C., 1999, The radial trace transform: an effective domain for coherent noise attenuation and wavefield separation: 69th Annual International Meeting, SEG, Extended Abstracts, 1204-1207.
Henley, D. C., 2000, Wavefield separation and other useful applications in the radial trace domain: 70th Annual International Meeting, SEG, Extended Abstracts, 2111-2114.
Henley, D. C., 2003, Coherent noise attenuation in the radial trace domain: Geophysics, 68, 1408-1416. Karsli, H., and Bayrak, Y., 2008, Ground-roll attenuation based on Wiener filtering and benefits of time-frequency imaging: The Leading Edge, 27, 206–209. Liu, X., 1999, Ground roll suppression using the Karhunen-Loeve transform: Geophysics, 64, 564–566. Melo, P. E. M., Porsani, M. J., and Silva, M. G., 2009, Ground roll attenuation using a 2D time derivative filter: Geophysical Prospecting, 57, 343–353. Montagne, R., and Vasconcelos, G. L., 2006, Optimized suppression of coherent noise from seismic data using the Karhunen-Loève transform: Physical Review E, 74, 1–9. Naghizadeh, M., and Sacchi, M., 2011, Ground roll elimination by scale and direction guided curvelet transform: 73rd Annual International Meeting, EAGE, Expanded Abstracts, 23-26. Olhovich, V. A., 1964, The causes of noise in seismic reflection and refraction work: Geophysics, 29, 1015- 1030. Ottolini, R., 1979, Migration of radial trace sections: Stanford Exploration Project Report, SEP-20, 97-115. Ottolini, R., 1981, Downward continuation of common midpoint gathers by transformation into Snell trace coordinates: Stanford Exploration Project Report, SEP-26, 83-94. Porsani, M. J., Silva, M. G., and Melo, P. E. M., 2009, Ground-roll attenuation based on SVD filtering: 79th Annual International Meeting, SEG, Extended Abstracts, 3381-3385. Taner, M. T., 1980, Long-period sea-floor multiples and their suppression: Geophysical Prospecting, 28, 30-48. Wu, N., Li, Y., and Yang, B., 2011, Noise attenuation for 2-D seismic data by radial-trace time-frequency peak filtering: IEEE Geoscience and Remote Sensing Letters, 8, 874-878. Yarham, C., Boeniger, U., and Herrmann, F., 2006, Curvelet-based ground roll removal: 76th Annual International Meeting, SEG, Extended Abstracts, 2777–2780.